Prep it, cook it, freeze it, heat it, eat it. Whip yourself up a batch or two of this easy, healthy pasta and pizza sauce, and keep it in your freezer. 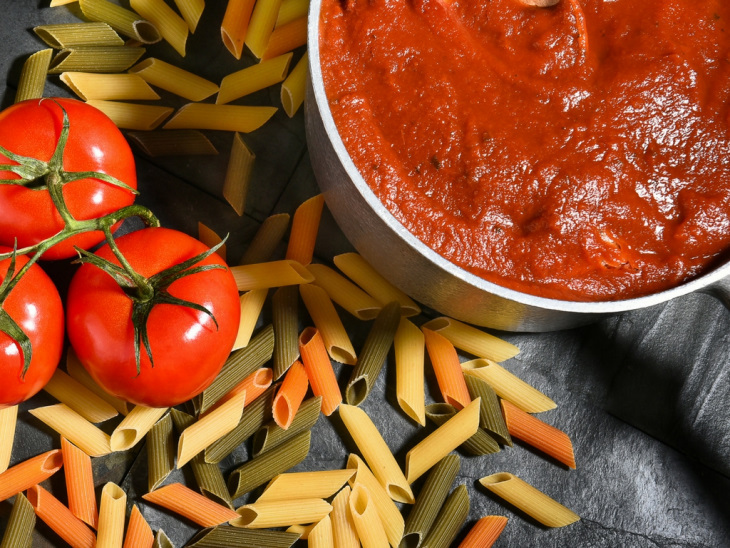 Ever have trouble finding no-sugar-added pasta sauce at your local grocer? Or do you stagger at the price? Make your own for a fraction of the cost. If you have an Instant Pot, you can make this recipe in there easily! Instructions included! Heat oil in a large skillet or stockpot over medium heat. Add garlic and onion. Sauté until garlic is fragrant and onion is soft, about 5 minutes. Add vinegar, basil, tomato paste, italian seasoning, and both cans of tomatoes. Bring to a boil. Reduce heat and simmer 20 minutes. Stir in parsley. Serve immediately or freeze in reclosable freezer bags, mason jars, or freezer-safe plastic containers. To use after freezing, simply heat in the microwave until hot, or heat in a saucepan until hot. No need to thaw first. Heat oil in Instant Pot® on sauté. Add garlic and onion. Sauté until garlic is fragrant and onion is soft, about 5 minutes. Add vinegar, basil, tomato paste, italian seasoning, and both cans of tomatoes. Lock lid. Set valve to sealing. Program for manual-high and 5 minutes. Use either quick release or natural pressure release when cook time ends. Stir in parsley. Serve immediately or freeze in reclosable freezer bags or freezer-safe plastic containers that are instant-pot friendly, such as the ones in the NOTES below. To use after freezing, remove from plastic container and add to instant pot with 1/2 cup water. Lock lid. Set valve to sealing, and program for manual-high and 0 minutes. Approximately 3 cups of sauce (24 oz) is the equivalent of 1 jar of commercially available sauce. If you don't like "chunky" sauce, use 2 28 oz cans of crushed tomatoes instead of diced. If you like your sauce extra "chunky," use 2 28 oz cans of fire roasted diced tomatoes instead of crushed. Use on cooked pasta, with or without meat. Use on pizzas like any of these recipes: Treeza Crust, 100% Whole Wheat Pizza, Pizza Grilled Cheese, English Muffin Pizzas, and MORE. Use in Chicken Parmesan Casserole. Use for any recipe that calls for pasta sauce, marinara, or pizza sauce. My family loves this spaghetti/pizza sauce! No more store bought sauce for us! Need to make a double batch of this soon. We love it on spaghetti, lasagna, as pizza sauce & with pizza grilled cheese!